We provide full-service beekeeping in Winnipeg's urban centre. At Beeproject, we are committed to supporting the declining population of pollinators, specifically the honeybee. Our Urban Pollination Project will allow you to have a hive without knowing a lot, or anything, about beekeeping. This program is meant to be a turn-key operation in which we install and maintain the hive(s) and deliver the ultra local honey to you at the end of the season. You’ll have the chance to get up close to the hive and learn basic beekeeping knowledge. You’ll also get to observe the magic of honey production and the seasonal changes of the hive. We believe that public awareness and education are key to making a difference in the plight of the bee and other pollinators. We believe in sustainable beekeeping methods and take great care to keep our bees in an ecologically mindful way, knowing that great honey is made by bees that are well cared for. Let us know who you are and why you're interested. We'll need to figure out if your location is suitable for bee hives, whether your organization is interested in workshops, or honey, or both, and a few other details which will determine pricing. We will visit your location to find the best placement for the hives. When the season starts up (usually May), we will bring all of the hives, the equipment, and the bees. This is a turn-key operation, and you don't have to do anything — unless you want to! Every beehive is made up of thousands of living creatures and requires proper care to prevent disease, swarming, and to maintain the health of the hive. We will visit your hives every 1-2 weeks to check up on it's health, apply any needed treatments, and add more boxes if they need the room. You will also have the opportunity to observe and learn about honeybee hives and beekeeping. We'd love for you to join us to learn more! Extract the honey & take it home! 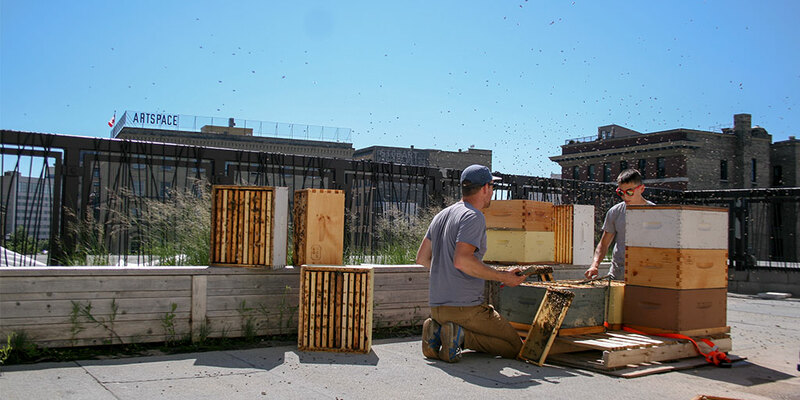 City bylaws allow beekeeping in all zoning areas of Winnipeg. See permit and bylaw information on the City of Winnipeg website.